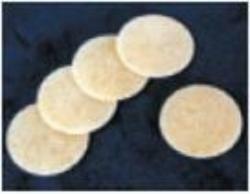 Sample text: These high-quality whole wheat wafers are 1-3/8 inches in diameter. They are a thicker wafer that is stamped with the cross, made with whole wheat flour and water. Available in boxes of 1000, whole wheat.